Are you regularly craving something spicy? Do French fries or potato chips give you a hard time to resist? 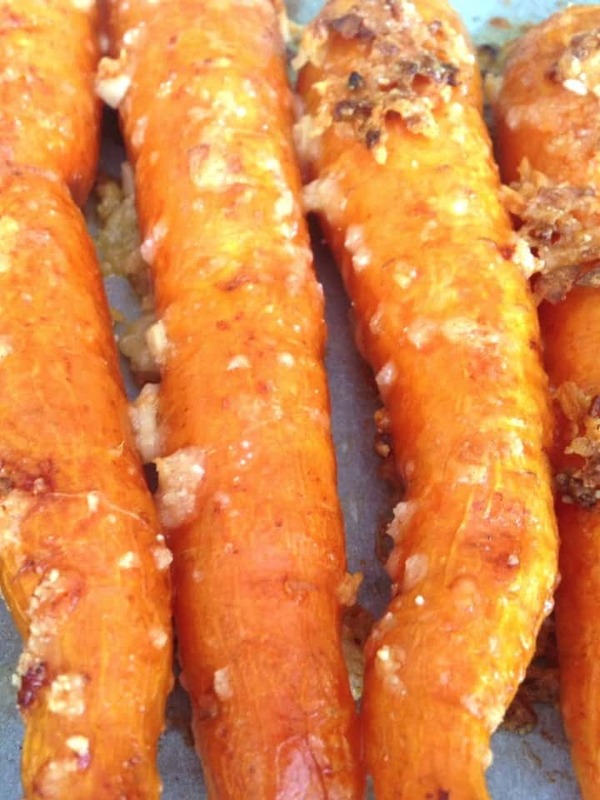 Then these Parmesan roasted carrots in the oven might be a delicious compromise. They are almost as spicy as chips with less carbohydrates and fats. For this easy side-dish with only 5 minutes prep, you just whisk together a few ingredients and let your baking oven do the rest. 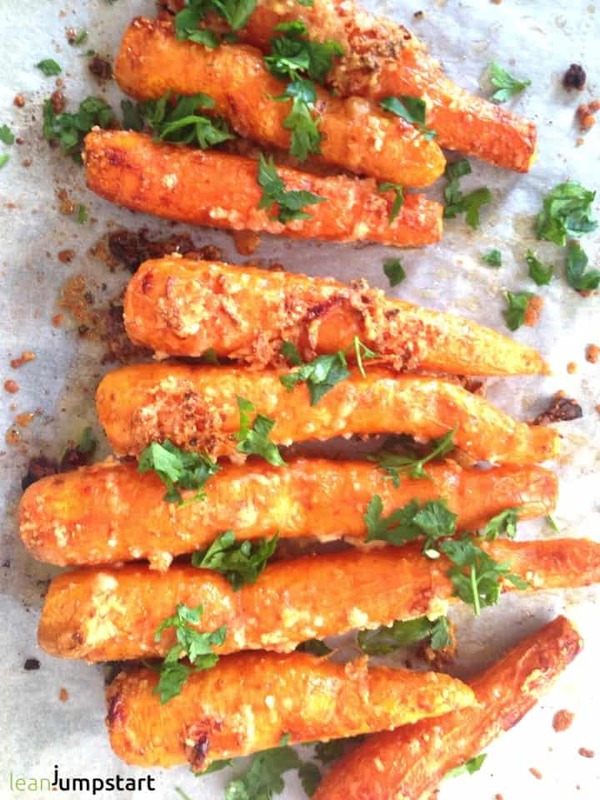 Once you’ve tried this simple recipe it might become your favorite way to prepare carrots. Seriously, they are that good! While they are baking you can easily prepare a hummus dip, homemade ketchup or combine it with steamed spinach for a light clean eating lunch. Oven roasted carrots make a great side dish to any meal! In my opinion, it is the most delicious side dish ever. But you will also love them just in between for a wholesome clean eating snack. As a lover of a lean, clean eating kitchen you can’t have enough creative vegetable recipes. 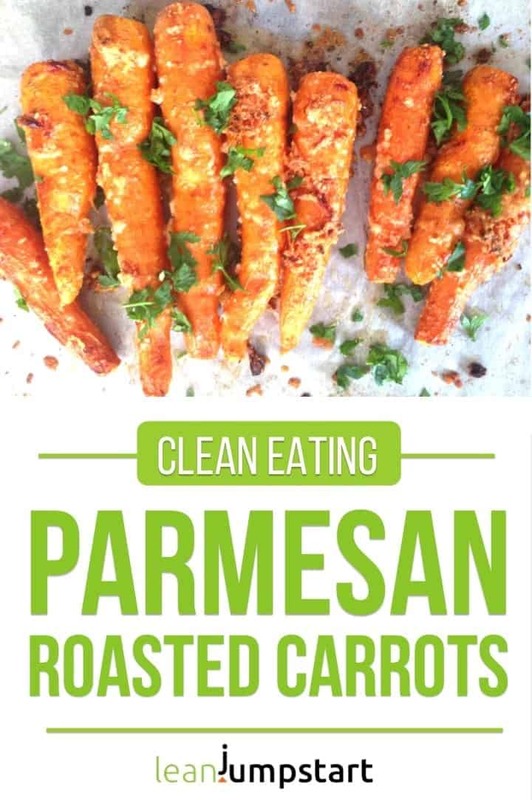 Oven roasted carrots with Parmesan can take your carrots and thus nutrient consumption to the next level. In addition, they supply your body with beneficial soluble and insoluble fiber. What are you waiting for, give this snack a try and let me know how you like it in the comment section below! Preheat the oven to 400 degrees F/200 °C. Pat carrots dry using a paper towel and place them in a large bowl. Add olive oil, Parmesan cheese and garlic and toss gently to coat. Arrange the carrots on a baking sheet lined with parchment paper. Roast for 15 minutes, then turn carrots around. Roast for another 10 minutes or until the cheese is slightly browned. Eat it as a healthy snack or combine it with e.g. steamed spinach to a skinny clean eating lunch or dinner. No time for weight management? Do you have little time but love the idea of a simplified clean eating kitchen to lose weight or stay in shape? Then check out my 52 Chef Habits Ecourse with a strong focus on yummy vegetable recipes that are quick and easy. Click here! Looks good and easy. I will try them. Yes, for sure, don’t miss this healthy snack!